I love antique furniture, craigslist finds, thrift store treasures… especially at a huge bargain. Often, the bargain comes at the price of a bit of time to transform a piece into exactly what I want. 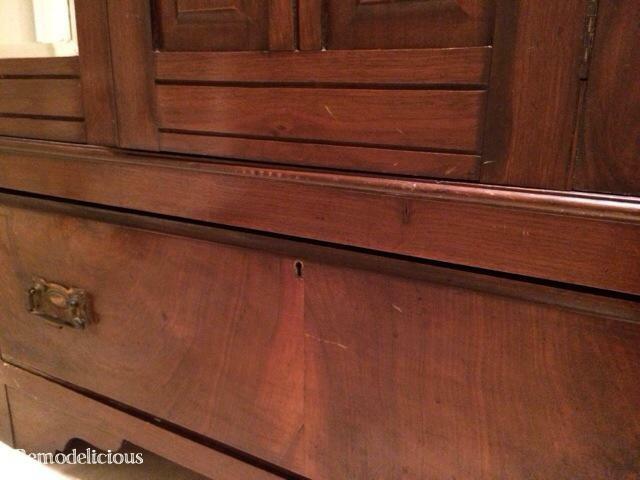 This armoire is one such piece. It was thrown in for a steal when I went to pick up a craigslist find. It’s meant to be a replacement for our coat closet which was sacrificed by the former owner to create more kitchen space. We’re all on board with that, but still needed a place for coats & hall closet items since our closets are nothing to write home about (and we are using every last inch of them). Why not do it in a pretty way, like this armoire? One of the main problems with old drawers is that they fall out. We needed a fix for this and a few other antique pieces since we have little girls into every corner of the house who don’t need fully-loaded drawers crashing down on their feet. There are big re-do plans for this piece and I wanted to fix all of its issues before refinishing it. I came up with a quick and dirty solution to this problem using scrap material (free = happy face). I took a piece of thin plywood left over from our mud hall cabinet and cut a strip using our jigsaw. Then, I made a pilot hole in the wood strip. 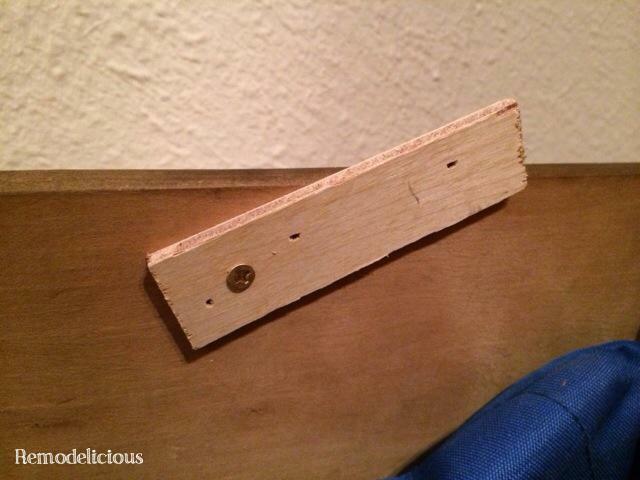 I attached it to the back of the dresser with a short screw so it wouldn’t go through the back side. It’s tight enough to hold the strip on, but allows the strip to rotate. 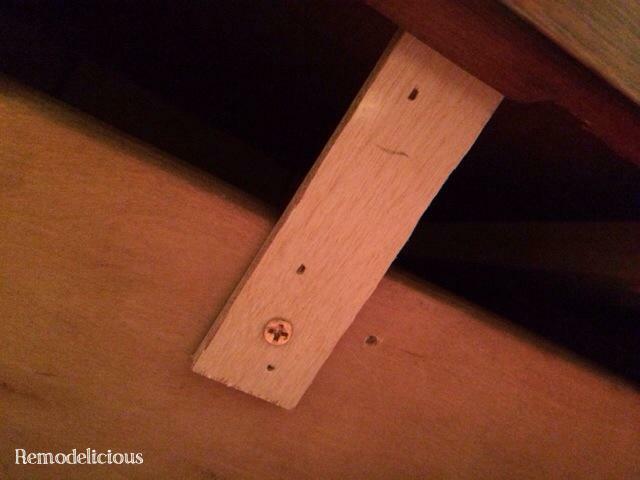 After putting the drawer back in, rotate the wood strip up so it catches on the frame of the drawer opening. It worked great and I’ll be adding this to some other furniture that the girls use!